The Crowood Press from the UK has been busy publishing a wide range of historical titles that are of interest to aviation historians and modelers alike. This one is an obvious favorite of mine seeing that I am also the webmaster for the F-100 Super Sabre website. Anyone who has acquired a few books on the 'Hun' know that the name David Menard means that the book is going to be thorough. You've also seen many of his photos illustrating the titles of many Hun monographs. The title covers the development and operational history of the aircraft, complete with an impressive array of photographs and illustrations. The center of the book contains eight pages full of color photography that would otherwise not convey the variety of unit color schemes that were worn by this aircraft. 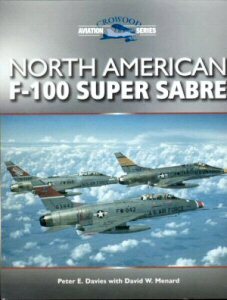 The book covers F-100 operations in Vietnam as well as F-100 operators from the active duty USAF, the Air National Guard and several notable foreign air forces. The appendices cover the difference between F-100 versions, production serial numbers, F-100 units, F-100 combat losses, museum F-100s, and a listing of the F-100s that served as drones. This book is a must-have for the modeler and the historian alike! You can purchase this and any of the Crowood series from Motorbooks or from your favorite bookstore. My sincere thanks to Motorbooks International for this review sample!